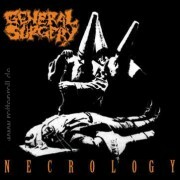 GENERAL SURGERY’s Necrology is a murderously savage operation performed by four sanious Swedes (2 of whom were members of DISMEMBER and AFFLICTED) recorded in unsanitary Sunlight Studios during November 1990. Dual vocal malpractitioners spew obnoxiously putrid gargling gore. The oozing catchiness is heinously highlighted by sickening riffs played with perversely pathologic surgical skill. Necrology will reduce listeners to violated postulated cadavers. Now remastered and reissued with 3 bonus tracks.